Elevate teatime with these unique blends of teas and flowers that create spectacular floral masterpieces—plus a delicious cuppa! 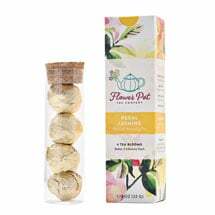 When activated by hot water, the Blooming Tea and Blooming Floral Tisane unfurl to display gorgeous natural blooms that create delicately flavored beverages. The caffeine-free Bright Chrysanthemum has honey and herb flavors, while the Regal Jasmine brews a fragrant white tea flavored with sweet nectar. 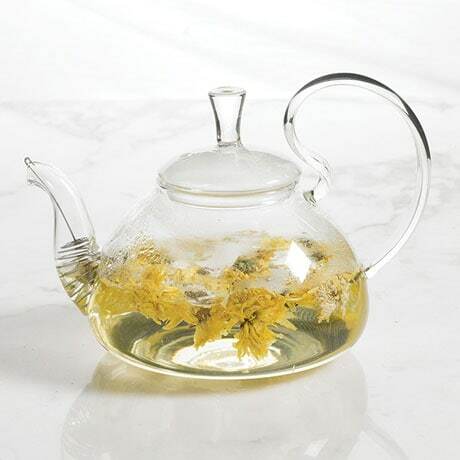 Simply place four chrysanthemum blooms or one jasmine tea bloom into the Glass Teapot and fill it with hot water; as the tea steeps, the magic unfolds! The 800-milliliter teapot is made of lightweight, heat-safe borosilicate glass, sized to infuse one tea bloom, and the removable wire filter in the pot's spout will keep stray petals from sneaking into your cup. The blossoms last up to five days, making for an eye-catching centerpiece! Teapot is dishwasher safe, but handwashing is recommended.